The fall of Acre to the Mamluk armies in 1291 is conventionally seen as marking a major caesura in the history of crusading. Indeed in traditional historiography it was viewed as effectively marking the end of the crusades- everything that followed was simply an increasingly anachronistic epilogue. Acre was the last crusader bridgehead on the east Mediterranean mainland and had been the de facto capital of the residual Kingdom of Jerusalem for around a century. Its fall deprived any future crusading army of a base for operations inland. It also led to the devastation of the city as the Mamluk rulers opted to destroy it rather than risk its recapture. The 1291 siege was merely the last in a series; Acre changed hands four times in just under two hundred years. 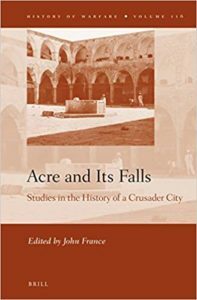 The volume under review seeks to take account of this longer context (though Saladin’s capture of the city in 1189 is dispatched in a few lines in the editor’s introduction and in practice half the ten contributions relate to 1291), with a glance at Acre in times of peace as well. Susan Edgington considers Baldwin I’s failed attack of 1103 and its successful follow-up the next year. Baldwin’s strategy was clear. Coastal cities which had simply been bypassed by the First Crusade on its way to Jerusalem now had to be mopped up if his fragile kingdom was to survive, and Acre (much the best of an indifferent bunch of ports on the Palestinian littoral) was a prime target. To do the job, however, Baldwin needed naval support. Much of Edgington’s piece is taken up with evaluating whether there was a Pisan component in the Genoese-dominated fleet which assisted him. She concludes that there was but that its presence was occluded from the most contemporary chronicles for political reasons. The most specifically military contribution comes from John Hosler who gives a very detailed analysis of one moment within the epic 1189-91 siege- a sally against Saladin’s camp in November 1190. Although ultimately of little strategic significance, he argues that this was extremely well managed and indeed was a textbook example of a Clausewitzian “fighting retreat”. One can be impressed by the discipline and cohesion displayed by the crusading forces in a difficult situation while wondering whether implicitly marking their performance against twentieth century staff college yardsticks is a useful exercise. Danish participation in this siege provides Janus Moller Jensen with a hook for considering the impact of crusade ideology on Danish (and to an extent wider Scandinavian) society and culture. This provides a fascinating insight into an area all too often overlooked in standard histories of the crusades and picks up echoes of crusade preaching in sagas and even church decoration. Its links to Acre are however somewhat tenuous; the main Danish expedition linked to the preaching of the Third Crusade arrived too late to participate in serious fighting while the activities of the Danes who were actively involved in the siege vanish into a haze of myth. One consequence of the 1189-91 siege was the creation of what became the Teutonic Order. Despite its later links with Baltic crusading, the Order was active in Acre right to the end (and indeed was expanding its holdings in the city in the last years of Crusader rule). Adrian Boas and Georg Philipp Melloni report on the rather fragmentary archaeology of the Order’s main compound. In its heyday Acre was an economic and even cultural centre, marked by considerable cultural and religious diversity (far too much for the liking of its most famous archbishop Jacques de Vitry). Jonathan Rubin examines the work of the translator John of Antioch, active in the city in the later thirteenth century, and his notably high evaluation of the possibilities of the (French) vernacular as against Latin. He suggests that this reflected a world in which French was taught as a high status “second” language, and possibly the impact of a genuinely multi-lingual environment. The five pieces linked to 1291 focus more on the aftermath of the fall than on the siege itself. Paul Crawford considers the blame game which ensued and asks “Did the Templars lose the Holy Land?”. The answer (unsurprisingly) is negative, though it is clear that some contemporaries and near-contemporaries were inclined to that view. Anne Gilmour-Bryson contributes a rather muddled and confusing account of events in Cyprus in the years following 1291 when the island was full of refugees from Acre and other lost mainland cities. Charles Connell embarks on a rather dense and complex examination of the reaction of “public opinion” in Europe to the fall of Acre. His conclusion appears to be that this was a good deal less concerned about events than the papal reaction would have liked it to be, as evidenced by the fact that (unlike events in the 1140’s and 1180’s) no major crusading expedition took place in response. Though Connell does not quite put it this way, his argument might suggest that thirteenth century developments identified by historians like Christopher Tyerman whereby crusading moved from being a series of one-off events preached by charismatic individuals like Bernard of Clairvaux to an institution of the church with a standardised “playbook” in the long run undermined its potency. Iris Shagrir focuses on one of the key sources for the events on 1291, Thadeus of Naples. Probably not an eye-witness (though contributors to the volume seem to differ on this), he certainly knew Acre well and wrote his account in Messina shortly after the event. It remained popular, with copies circulating well into the fifteenth century. Full of colourful stories and incident, his account managed to criticise just about everybody involved (only those killed in the fighting gained any grace in his view) and predictably asserted that Acre had fallen because “of our sins”; less predictably, he sometimes appears to question whether Christians deserve the Holy Land and vice versa. Finally, Marie-Luise Favreau-Lilie looks at the long term memory of 1291 in Genoese, Pisan and Venetian chronicles. In the first an increasingly inflated view of the (genuine) actions of Genoese citizens in saving refugees took hold in parallel with claims over Cyprus. In Pisa the whole affair was largely forgotten. In Venice, which had left Acre to its fate, the issue was equally overlooked until the second half of the fifteenth century when, in response to criticism of Venetian dealings with the Ottoman empire, a glorious past of steadfast resistance to the infidel was concocted. This slender and pricey book is, it has to be said, somewhat disappointing. Too many of the contributions are slight; perhaps the most interesting (that of Jensen) has little to say about Acre. Opportunities for dialogue between contributions (e.g. between Jensen and Connell) are missed. There are also niggling presentational issues. Contributors cannot agree on how to spell Thadeus of Naples’ name, there is an irritating sprinkle of typos (though “Charlemagne and his pears” has a certain charm..) and the only map seems to relate to an engagement during the 1189-91 siege which is not covered in the text. Overall one feels that this is something of a missed opportunity.